Kindergarten is an exciting time of exploration for your child and, as parents, you want your child to have the best experience — that comes from being prepared. Being ready for kindergarten means having well-developed pre-kindergarten skills and being academically, socially, and physically ready for the transition from pre-kindergarten to kindergarten. This includes everything from being able to write their name and follow directions to being able to go to the bathroom by themselves and problem-solve. Parents play an essential part in preparing their child for this new and exciting experience. The first thing is to research schools in which you would like to enroll your young learner. When you find the school that best fits your child, share the school’s requirements with your child’s pre-kindergarten teacher. By doing this, the teacher will be able to work with you to identify needs and incorporate them into their curriculum and weekly plans — this is key for ongoing success. While each school may have different requirements, here is a basic checklist of skills your child should have to ensure a smooth transition. Letter recognition is the ability to identify letters of the alphabet. 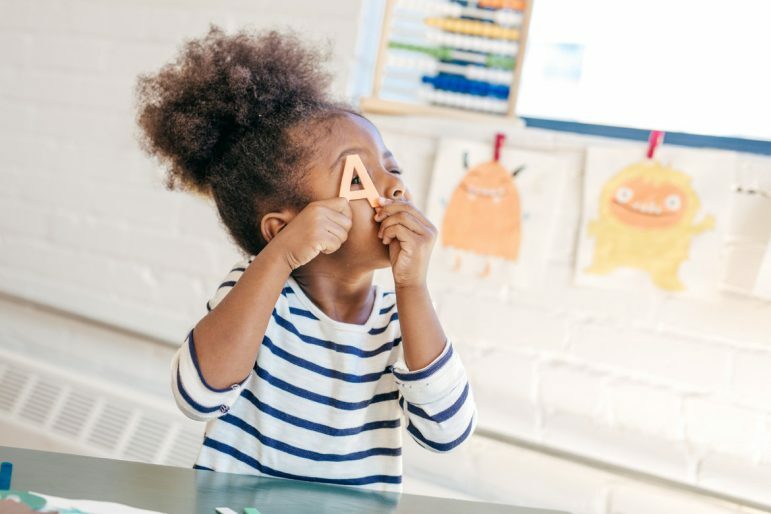 Ideally, your child should be able to recognize and say all the letters in their first name as well as identify most upper- and lower-case letters. Students should be able to write their first name with the first letter as an upper case and the remaining letters in lower case. This includes being able to properly grip a pencil, crayon, or marker correctly (with the thumb and forefinger supporting the tip). While they may not be able to fully read it, young learners at this stage should know how to hold and handle a book. They should know which pages come first and understand that words are read from left to right. They should also be able to sit and listen well to short stories (5-10 minutes) and show interest in reading-related activities. Students should also be able to rhyme easy words, such as hat, fat, bat and cat and make most letter and sound matches. Children who can do this tend to become better readers. Your scholar should be able to retell information from a story. They should also be able to sequence a series of three pictures to tell a story. Young learners should know how to properly use scissors and other art materials with relative ease. This includes knowing how to hold a pencil, crayon, or marker correctly and how to cut out shapes. Students should be able to identify basic shapes, such as triangles, squares, rectangles, circles, ovals, stars, and heart. They should also be able to arrange and group different objects by shape. In addition, they should know their basic colors: red, blue, green, black, white, orange, yellow, pink, and purple. Your young scholar should be able to count to 10 and recognize and name numbers 1-10, even when they are out of order. This includes being able to count 10 objects, pointing to each one as they count. Kindergartners need to know how to listen with understanding to directions and follow one- and two-step directions and problem-solve. Your young learner will need to be able to communicate with others without your help. This includes speaking clearly to be understood without context clues and speaking in sentences that express and describe their feelings. This would be a good time to also teach them appropriate volume (i.e., indoor and outdoor voices). Students at this age should be developing their fine motor skills, which is the ability to move and control small muscle movements of the hands, fingers, face, mouth, and feet, as well as their large body movements. This includes being able to bounce, throw, and catch balls during outdoor playtime, as well as run, climb, jump and gallop. Preschool is a great time to help your child develop social skills to interact with other people verbally and non-verbally. This is done through body language, gestures, and personal appearance. They should also be able to share with other scholars and learn how to solve problems without using anger and aggression. By this stage, kindergartners must be able put on and take off outer clothing, zip their coat and tie their own shoes. They must also be able to use the bathroom by themselves. Teachers can’t help with this, so students must know how to handle their clothes, wipe themselves and wash their hands. Being able to clean up their messes and in the classroom helps teach responsibility and helpfulness. While not necessarily a requirement, this is a great time to help your young learner with their sensory development. Sensory play uses our five senses: seeing, hearing, feeling, tasting, and smelling. Research shows that sensory play builds nerve connections in the brain’s pathways, which helps children complete more complex learning tasks. According to Goodstart, sensory play is great for language development, cognitive growth, problem-solving skills, and social interaction. Sensory play activities, such as playdough, finger painting, and water/sand play help stimulate all core senses and are a familiar and very natural way to explore and process new information. These are some of the primary skills your young learner needs to learn ahead of kindergarten. If you are in doubt of your child’s readiness, it is of the essence to voice your concerns. Talk to your child’s pre-kindergarten teacher, view the new school’s curriculum, ask questions about the curriculum. You can even tour the school and observe a kindergarten classroom. Speak to other parents, listen, think about your child, and then go with what best fits the need of your child. Trust your instincts! You know your child best and you are familiar with your child’s learning style. Kimberly V. Porter, M. Ed. is an early childhood development professional, author, and editor-in-chief for eLATION magazine. She welcomes reader responses to kporter@spokesman-recorder.com.